Swedish Death Metallers ENTRAILS release ‘Bloodhammer’! 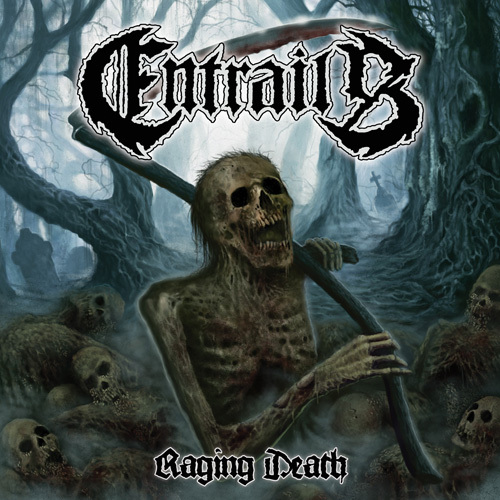 Swedish Death Metallers ENTRAILS has released the second single taken off their upcoming new album Raging Death! Surf over to the website of Rock Hard Germany HERE to check out Bloodhammer, a song that is for sure heavy enough to get you on your knees! Make also sure to click at www.metalblade.com/entrails to check out the stunning artwork of Raging Death as well as the first single In Pieces! Pre-order options are online, there’s also a shirt available! Raging Death will be released the 10th/13th of May via Metal Blade Records in Europe on vinyl, as a limited Digi-CD with bonus-cd and as a jewelcase-CD. Only the vinyl version and the limited Digi-CD will include the MARDUK-cover Dark Endless as a bonus track! More details on the content of the bonus-cd will be revealed shortly. Raging Death was recorded in different studios, the drum recordings took place at the Racetrack studios while the basis recordings were done at Jimmy’s own The Crypt recording studios. The album was mixed and mastered by Dan Swanö at Unisound. ENTRAILS formed in the ’90s, but split up before they were able to release a demo or even an album. It took them until 2008 to come back when guitarist Jimmy Lundqvist rediscovered some old tapes. In a moment of nostalgia, he decided that they deserved to be released as they should have been originally. With modern recording technology, the first ENTRAILS demo could finally take shape. After releasing another demo in 2009, ENTRAILS recorded and released their debut album, Tales From The Morgue, in 2010. Just a year later, The Tomb Awaits was released, an album that gained worldwide attention of music fans of the extreme and was considered by many as the best death metal release of 2011. ENTRAILS has played numerous prestigious festivals in 2012 including gigs at Party.San Open Air, Summer Breeze Open Air and Hell Inside festival.